The Lahore High Court Bar Association (LHCBA)General House on Wednesday condemned attack on the PNS base in Karachi and demanded an immediate inquiry into the intelligence failure and weak security around the base. Presided over by LHCBA president Asghir Ali Gill, the House denounced the killing of two advocates in Karachi and expressed solidarity with Sindh’s lawyers. 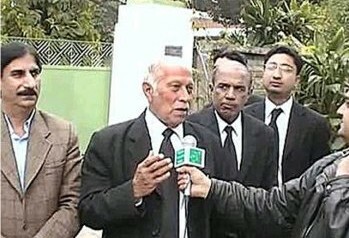 Bar secretary Arshad Malik Awan, advocate Ghulam Farid Sanotra, Musthtaq Raj, Liaqat Ali Qureshi, Ahmad Awais, Mian Hanif Tahir, Allah Buksh Gondal, Rana Saeed, Rashid Lodhi, Muhammad Arshad Virk and Muhammad Nawaz Cheeema were united in saying that Sindh’s lawyers had been targeted because they had been resolute to restoration an independent judiciary during the lawyers movement. Asghir Ali Gill demanded that the production of those who killed the Karachi advocates. He terms the PNS base incident a serious incident and called for a united stand by all stakeholders on the security of military installations. He said that the Pakistan army still had the support of the public in this hour of trial and demanded a judicial commission to probe the PNS, Abbottabad and GHQ attacks to pin responsibility for fragile security arrangements at the institutions. He said Pakistan stood against terrorism and would not let it flourish. The house adjourned after offering fateha for assassinated lawyers of Karachi.